Seth is quoted in today's Science Times article about why the recent discovery of Earth-size planets is good news for alien-hunters. Also, how to build a planet. “They’re archaeologists!” says an obviously pleased Henry Jones when he discovers that aliens have an interest in human cultural history. 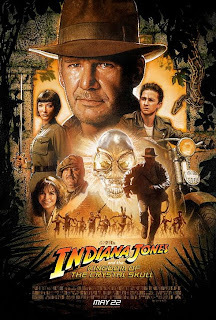 It’s a throw-away line in “Indiana Jones and the Kingdom of the Crystal Skull,” the latest installment of the popular (and lucrative) Indiana Jones franchise. This ongoing cinematic success – in case you’ve been living in a bank vault since 1981 – features a slouch-hatted professor who is as practiced with his fists as he is with off-handedly dishing out Olmec and Mayan history. The premise of the "Crystal Skull" is that aliens have come to Earth. Jones' mission – which he takes on only under duress – will eventually get them to leave. Lamentably, the story line is less than crystal clear, and credibility is flagrantly absent. But when Indiana mutters “they’re archaeologists,” he's hitting on a possibility that Hollywood has seldom considered. But what would motivate real aliens to come to Earth? Detonating the White House – while amusing in its own way, and probably without consequence – hardly sounds like a project justifying a trip of hundreds of light-years. A romp with the local rug rats is similarly implausible. Equally suspect are scenarios in which the extraterrestrials have come for the water or other natural resources. These are substances they can find much closer to home, thereby ensuring that the transport costs don’t dominate the price tag. But what the aliens can’t find at home – what is inevitably special in a universe where chemistry and physics are everywhere the same – is culture. Our physics texts will inevitably mirror theirs. But our art works, music, and literature won't. Most Tinsel Town narratives about invading creatures from far-off worlds are tough to swallow. The latest Indiana Jones piece isn't easy to ingest, either. It's thoroughly preposterous in a thousand different ways. But when it comes to why real aliens might find our world, or the worlds of other sentient species, worth the travel – the whip-wielding professor may have made a discovery. Indy science: all it's cracked-the-whip up to be? We are producing a show this week on the science of the latest Indiana Jones movie for Skeptical Sunday. Has anyone seen the movie? Wonder whether he could really survive falling over three 100 foot waterfalls? Etc. Have questions for us? We'll try to answer them in the program! Read the rest of Seth's latest article at the SETI Institute's website. It can also be found at SPACE.com. Sam Wang was interviewed by Seth on the recent "Building Better Brains" show, and describes his interview and the show in his blog "Welcome to Your Brain". Did you see this story? Jeff Peckman, a Denver resident, is promoting the idea of an Extraterrestrial Affairs Commission for his city. On May 30, Peckman held a press conference in which he told the media that the Mile High Municipality needs to be prepared for close encounters of the weird kind. Peckman’s rationale for the additional bureaucracy was a video showing a purported alien head popping up outside a window and looking around. The video was made by another man – Stan Romanek – in his Nebraska home five years ago (he’s since moved to Colorado). Romanek is clearly on the aliens’ dance card: he claims to have sustained more than 100 encounters with visiting extraterrestrials. He was driven to make the video because this particular Peeping Zork had been unwholesomely spying on his teenage daughters. Now they didn’t actually play the video during the press conference: Romanek and Peckman merely showed an excerpted, fuzzy still frame. But Mathew Baxter, a skeptic in the Denver area, quickly shot his own movie of a nosey extraterrestrial – a fake which has confused a lot of people on YouTube and elsewhere, but which shows how easy it is to construct “proof” that aliens are creating a nuisance in the Nebraska suburbs. Frankly, the evidence touted by Peckman should be thrown out of court. The imagery released so far is clearly unconvincing, not to mention the motivation (why would extraterrestrials come so many light-years merely to bug, yet again, Stan Romanek with their puerile behavior?) An easier incentive to grasp is Romanek’s interest in a bit of fame. Both he and Peckman were on “Larry King Live,” flogging the idea that this is finally the smoking gun in the matter of extraterrestrial visitation. So there you have it. The aliens are here, they’re spying on your teenage daughters, and it’s the scientists who are keeping this bad news from making the rounds. Sure makes sense to me. What does it all Ming? Here's "Ming", an Ocean Quahog Clam, Arctica islandica, family Veneridae, which may be the oldest living animal ever discovered. 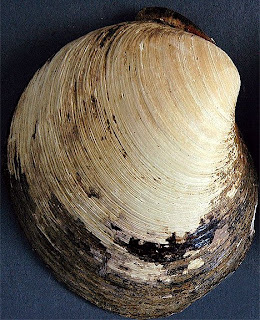 Judging by the annual growth rings on the clam's shell, Ming was believed to be in the region of 405-410 years old when the clam was caught off the coast of Iceland in October 2007. The clam was named after the Ming Dynasty due to its age.